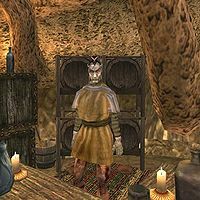 Drarayne Girith is a Dunmer trader who runs the Plot and Plaster shop in Tel Aruhn. He is a sleeper for the Sixth House, and he will be somewhat hostile to you until Dagoth Fovon is killed, releasing him from his enchantment. Drarayne has a selection of food and drinks for sale. He incorrectly claims that the Plot and Plaster rents beds. This page was last modified on 16 April 2017, at 16:59.